Rock 'n' Roll Stormtroopers are a German band, surprising me a sound that is distinctly 70's party rock. If you enjoy bands such as Slade and Sweet, this band is for you. I can't think of many bands still playing this sound nowadays. Given that the guys do it very well, fans of this sound should certainly give these guys a listen. As you look at the front cover, you can probably tell that this isn't a deep, introspective album reflecting on personal demons or problems in today's society. In recent years, we've heard a lot of albums dealing with problems in society and whatnot. In light of that, I find a fun, uptempo, carefree album like this to be very refreshing. Take another look at the song titles (Do the Pogo, Saturday Night, We're Gonna Rock You, Hanging Out With the Boys, etc…) and you'll clearly get the idea of what this band it about. On Fire is a short (just under 34 minutes), but highly entertaining album that won't let fans of this genre down one bit. The Stormtroopers keep the energy level at maximum throughout the album. I guess that's why they coined the term "bulldozer rock" to describe their sound. This would be a great album to blast on your car stereo driving down the highway on a weekend night. The songs are catchy glam/party rock anthems that unquestionably are a throwback to yesteryear. You'll even hear some use of the tambourine and hand claps throughout the album, certainly a nod to 70's party rock. The guitars are at the forefront of the sound, however. Catchy riffs and unrestrained solos and shreds can be found throughout the album. Even the guitar tone itself is very raw and "retro" sounding. Naturally, there is nothing all that technically challenging here, but it is well put together and pleasing to listen to. Harmony vocals are used for almost the duration of the album. In particular, the over the top chorus lines will cement themselves in your memory after just the first listen. This surely adds to the loud and energetic atmosphere the band is trying to create. While the album is quite short by today's standards, the album is consistent. Each of the songs is a fist pumping anthem that somehow makes you forget about all your problems for a moment. I found this to be the perfect soundtrack to drive home from work Friday night, welcoming the weekend. As I mentioned before, there isn't anything original or challenging about what the Stormtroopers are doing here. However, they really are a master of their craft, with not many other bands creating this sound today. The lyrics are nothing but mindless fun, somewhat of a refreshing deviation from the serous tones many releases today incorporate. Musically speaking, the album is well played. You can tell that the guys have a certain chemistry about them, truly enjoying the music they play. As I also alluded to earlier, the songs themselves are well written. Even though there is nothing new or complex here, I found myself absorbed by this album for the duration. As the weather warms up and my mood improves, I am sure to be blasting this album in my car this summer. 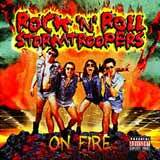 Fans of 70's style party rock will want to check Rock 'n' Roll Stormtroopers out. On Fire is throwback to a carefree, fun time in history, and also a fresh breathe in today's world. Hopefully the guys keep the albums coming. These guys do their thing well, and I feel that there is a place for simple, fun party rock, even today.